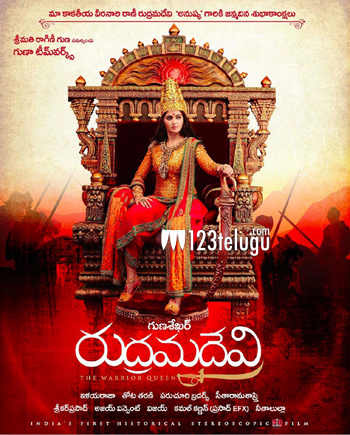 Anushka will be seen as the legendary Kakatiya warrior queen Rudhrama Devi in Gunasekhar’s period flick bearing the same name. The movie is going to hit the screens in 2014, as a summer entertainer. 50% of the shoot has been completed and a fresh schedule will begin from November 16th. The movie has 6 songs in all and 5 songs have been shot. The movie’s shoot will be wrapped up by March. Legendary music director Ilayaraja has composed the tunes for this movie. The film has a huge star cast. Rana Dabbubati will be seen as the male lead while Nithya Menen and Catherine Tresa will be seen in special cameos. Veteran actor Krishnam Raju, Prakash Raj, Suman and Jayaprakash Reddy will be seen in important roles. Gunasekhar is directing and producing this big budget period film. The first look of the film was released today, on the eve of Anushka’s birthday and the overall response has been quite positive. Anushka has been putting in special efforts for this movie.